Nuclear war is the ultimate, unthinkable catastrophe. But in some sections of the Russian media it is being viewed as a realistic possibility and even something to be embraced. As the crisis in Ukraine has deepened over recent months and Moscow's relations with the West have become ever more strained, talk of nuclear war has been looming large in the Russian media. In fact, as liberal journalist Yuriy Saprykin recently noted, it has almost become "commonplace". Saprykin was struck by how presenters and listeners on independent radio station Ekho Moskvy now speak about nuclear war "more or less in the same way as if they were discussing increases in parking fines". 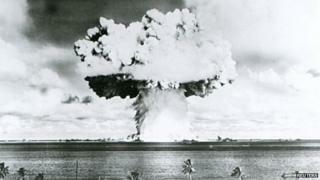 On other radio stations, the tone of the nuclear debate can be much more alarming. "Why are you all so afraid of nuclear war? Why are you afraid of nuclear war?" presenter Aleksey Gudoshnikov asked listeners to the pro-Kremlin station Govorit Moskva last month. He went on to say that people had survived the nuclear attacks on Hiroshima and Nagasaki in 1945, and that these were actually not as destructive as the bombing of Dresden some six months earlier. "This fear of nuclear war is exaggerated, in my view," the 26-year-old Gudoshnikov concluded. The starting-point of this disturbing trend was the boast made on 16 March last year (the day of the so-called referendum in Crimea) by controversial TV host and media executive Dmitriy Kiselev that Russia had the weapons to turn the United States into "radioactive ash". In a later interview with the Danish newspaper Jyllands-Posten, Kiselev said he had merely been making a "technical" observation, and that people should not accuse him of "dreaming" of such a thing. He has returned to the theme of nuclear war on his weekly show on state channel Rossiya 1 on more than one occasion since. Image caption Well-known TV host Dmitriy Kiselev claimed that Russia could turn the US into "radioactive ash"
On 8 February, he quoted an extract from Russia's military doctrine setting out the criteria for its use of nuclear weapons. Kiselev stressed that this could happen not just in response to a nuclear attack on Russia, but against any military aggression that "threatens the very existence" of the Russian state. He also stressed that the decision to push the nuclear button would be taken personally by Russian President Vladimir Putin, who "enjoys the unconditional support of the Russian people". Once again, a nuclear attack was presented not as something to be shied away from, but as a necessary measure to preserve the nation. Before the current version of Russia's military doctrine was published at the end of last year, there had been talk that the section on nuclear war would be updated to allow for the use of pre-emptive strikes. In the event, that section was left unchanged. Writing in the Moscow Times, Kremlin critic and military analyst Aleksandr Golts described it as a "wholly reasonable formulation regarding the use of nuclear weapons". Meanwhile, pro-Kremlin media regularly talk up the idea that Russia is indeed facing an existential threat, of the sort that could potentially permit a nuclear strike. TV news is full of stories about Nato's military build-up around Russia's borders, while commentators portray the West as being hell-bent on the country's destruction. In a talkshow on Gazprom-Media's NTV on 25 January, pro-Putin pundit Sergey Markov said the West was preparing the ground for the "elimination of the Russian people as an entity in world history". A week later, Kiselev was telling viewers of his weekly show that the "very existence of Russia is not part of America's plan". The matter-of-factness or even levity with which the Russian media now discuss nuclear weapons is new. The Soviet Union took pride in its nuclear arsenal. But it also viewed the actual use of nuclear weapons with abhorrence. Nuclear war was to be avoided at all costs - witness Khrushchev's climb-down in the Cuban missile crisis. By contrast, says Saprykin, some are losing their fear of nuclear weapons in today's Russia "where talk of when and how they might be used is a standard subject of public debate". Nuclear war - at least in the rhetoric heard in parts of the Russian media - is no longer unthinkable.